We had seen the basic procedure for creating a blogger account and also learnt how to select the best 'blog Title' as well as 'domain address' in the previous post Course - 1 | create a blog. Before going through initial basic settings that is needed to start a blog, we will understand some blog terms. Log in to your blogger account and you will be landing by default to the below shown page. 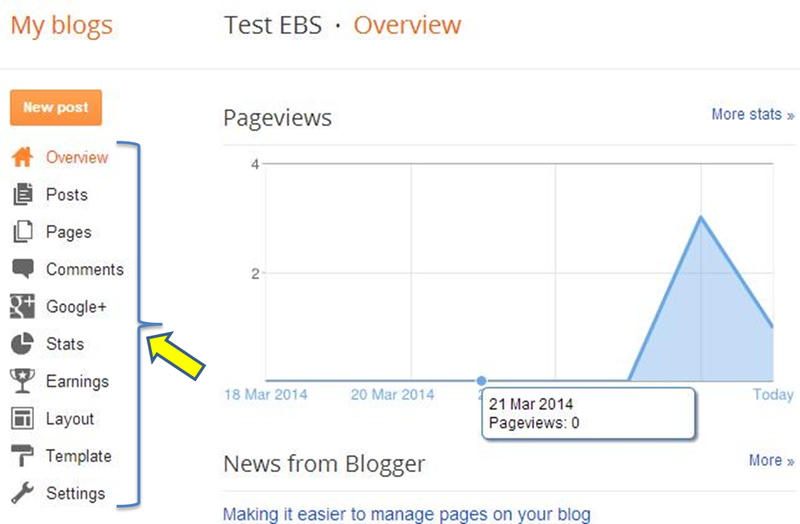 As you can see the blog name 'Test EBS' that I created in my previous section. Now click your blog name (in my case 'Test EBS'). If I have say three blogs then all that blog names should appear hear, like the one shown below. Like the name indicates, it gives an overall status of your blogs traffic. You will get a quick status of page views, comments etc. The below snapshot shows how the overview looks. Note the terms and functions. This will display a collection of posts that you created (published as well as draft) along with page view status. This is where you create new posts as well as edit already published articles. The below picture illustrates how Post section looks. As you can see there is a list of posts with labels and page views. Pages differ from post. Pages are more or less like the tabs and is the place dedicated to include categories (links). Pages can be considered as 'Static' as they remain visible to the visitors. Posts are the place where articles are written and shared to the world. A page can hold group of similar posts, but a post is meant for specific article. Pages are not updated in RSS feeder and is meant mostly for the use of some kind of static articles like 'About me'. Bloggers allow you to create only 20 pages while it allows you to create unlimited number of posts. To make you more clear; the page that you are reading now in this blog is a 'Post' and the page that will be seen by clicking any of the above tabs (placed at the top of this post - HOME, SEO, SMM, Create Blog etc) is termed as 'Page'. Just go through them and understand how I categorized post links. The below picture shows a snapshot of 'Pages' section of this blog. Just refer this for quick understanding. This is a section where your posts comments (published as well as waiting for modification) would be displayed. Remember the comments has been published can be deleted anytime later. The picture shows the same. You can note the tabs 'Remove content', 'Delete' and 'Spam'. Google+ link allows you to change settings to link your blogger account with Google+ account so that whenever you publish a post, then it may or may not get shared automatically based on your settings. By default, your blog will be linked, that will be fine. Stats is the juncture where you will be spending more time in blogger. This page will give you details similar to analytics like page views, post-wise traffic, sources of traffic (URL's and referring sites) and audience (location of view, browsers). Stats will be more useful to track your blogs status once you start blogging. Check my blog stats and note what are all shown in that page. This will not be useful for now. It will be useful only when you start monetizing your blog. For now take it lightly. Add new gadgets like pages (tabs), ads, social sharing buttons, subscribing links etc. Below picture shows this blogs layout. Compare the shown layout with this blog and you can easily understand about layout. note that we can re-arrange them by dragging and placing anywhere (except some gadgets; that we will learn soon). Change the existing design like background, text, colors, blog widths and everything needed to make the blog customized. 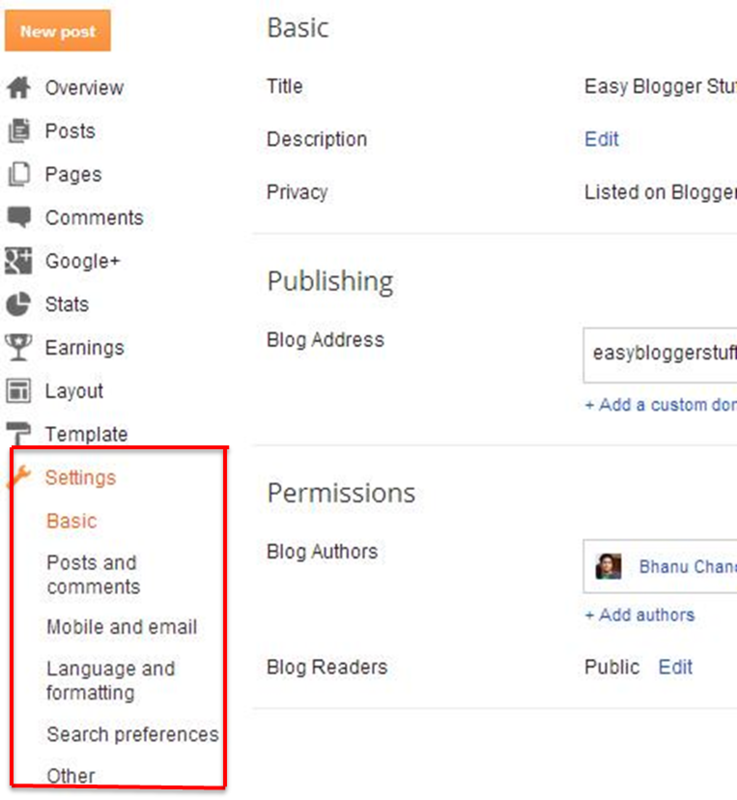 You may check the next part - Course - 3 | Basic Blogger settings required before publishing a post in my next course. Feel free to share your thoughts and suggestions by posting a comment below. Sharing is caring. Like us in social networks to get updated with latest posts. Subscribe to our free mail service in RSS feeder.